Festivities take place at the corner of St. Clair Road and Kercheval Avenue at 5:30 p.m. 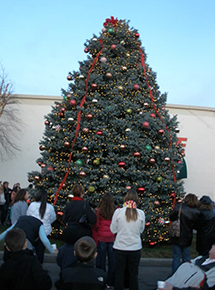 The official lighting of the Christmas tree is conducted by City of Grosse Pointe Mayor Chris Boettcher at 6 p.m. Guests will enjoy holiday carols from Grosse Pointe South High's Choir. Activities include warming fires and s'mores made available by the City's Department of Parks and Recreation. Complimentary coney dogs are made available by Mike Muir and the Harvard Grill and complimentary hot chocolate is made available by the Grosse Pointe Boat Club. The Village Tree Decorating is sponsored by the Grosse Pointe Foundation. The evening is made possible by the various sponsors and the City of Grosse Pointe Department of Parks and Recreation.